The custom dictionary is a special mechanism that allows creating company-wide dictionaries that are intended to extend the vocabulary of the standard dictionary with custom words specific to your industry, domain, etc. All the words added to a custom dictionary will be available for all users of a web application within a company. The custom dictionaries for Cloud customers are saved and stored on the WebSpellChecker Cloud servers. Such dictionaries can be created and modified only by a person who is authorized to access to the account panel on the webspellchecker.net website. The custom dictionary functionality is available for all customers who are holding a Trial or Paid subscription to Cloud WebSpellChecker Services. 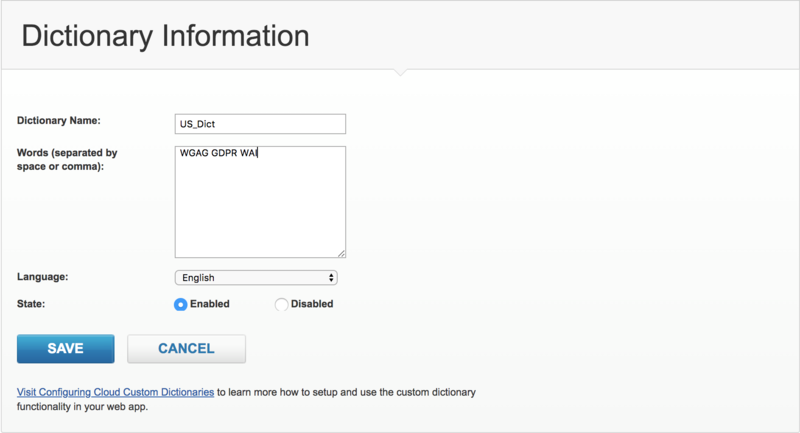 Management of custom dictionaries in the Cloud version is performed from a customer account panel at webspellchecker.net website. It allows an administrator of a subscription to create, edit, enable/disable and delete custom dictionary(ies) via simple user interface. Custom dictionaries are language-dependent. It is allowed to have multiple custom dictionaries per a language. There is no specific limit set on the total number of custom dictionaries that can be added to a single subscription. However, there is a limit set to a size of a single custom dictionary. It is two million symbols including spaces and commands. It is easy to get started with the custom dictionary functionality. Sign in to your account panel at the webspellchecker­.net website using your customer ID and password. These credentials were sent to an email address specified during initial subscription to the Cloud Services. Find the Dictionaries section on the main page of your account. First of all you need to add a new dictionary. As soon as new dictionary is added, it will be displayed on the list of your custom dictionaries. 4.1. Go to the Dictionaries section and click Add Custom Dictionaries. 4.2. Fill in all the necessary fields to create a new custom dictionary and click Save. Enter or copy/paste words separated by space or comma that you want to appear in the dictionary. The maximum allowed size of a single custom dictionary is two million symbols including spaces and commas. Select a language to apply a new custom dictionary for. The words from this custom dictionary will be used to extend the default wordlist of a chosen language dictionary. Choose a state for a custom dictionary. Two values are possible: Enabled or Disabled. 4.3. Apply the changes made to the service configuration on your web page or web app. 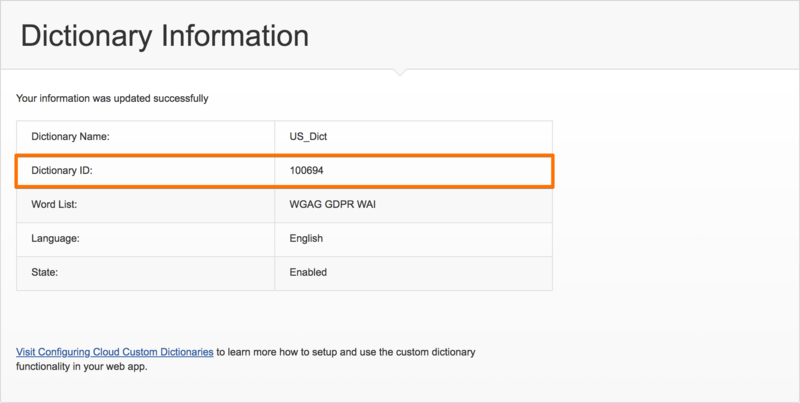 Once the dictionary is created, a unique dictionary ID will be assigned to your custom dictionary. Depending on the product and where it is integrated, pass an appropriate custom dictionary parameter (e.g. 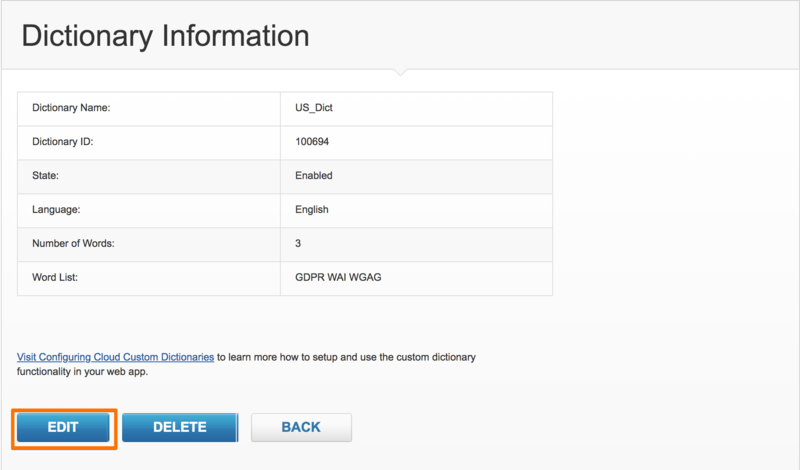 customDictionaryIds) with a required dictionary ID (DicId) as a value on your web app. This value you obtained on the previous step. 4.4. Verify the work of custom dictionary functionality. Before trying to test the work of a new custom dictionary, it is strongly recommended to clean your browser cache. Go to your web page and enter a sentence or a list of words that have been added with a new custom dictionary. The words that are present in your custom dictionary should be considered as correct. Moreover, if you try to misspell any of these words, in a correction box your should get a correct word as a suggestion for correction. 5.1. Go to the Dictionaries section and click List of Custom Dictionaries. This page displays the list of all available custom dictionaries. 5.2. Select the dictionary you want to modify (e.g. add new words) and on the dictionary page click Edit. 5.3. Modify the required fields (e.g. add new words). As all the changes are ready, click Save. 6.1. Go to the Dictionaries section and click List of Custom Dictionaries. This page displays the list of all available custom dictionaries. 6.2. Select the dictionary you want to delete and on the dictionary page click Delete and confirm your choice. 6.3. Apply the changes made to the service configuration on your web page or web app (see more details on section 4.3).